Longmont’s history as an ag town is still a major part of the town. There is also a thriving arts, theater and cultural movement that makes Longmont a destination for artists, artisans and culturati. West of Main Street and between 9th and 3rd, the homes are big and old, shaded by giant, old trees. They are in walking distance of the Longmont Theater Company, Muse Gallery, the Old Firehouse Art Center, Jester’s Dinner Theater and Friday night ArtWalk. 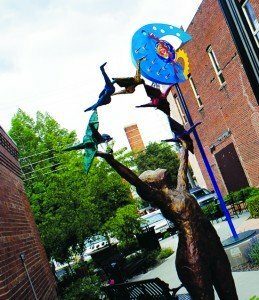 Down the road, just a bike ride or short car ride away, residents enjoy the Longmont Museum & Cultural Center, which hosts some spectacular artistic exhibitions. Longmont’s claim to fame: Charles Dickens’ relative was a civic leader here in the 1880s. Who’s in charge: Longmont’s mayor is also a part-owner of the popular brewpub, The Pumphouse.